If your family is like a lot of others in North Carolina and South Carolina, you live for the long spring and summer seasons when you can enjoy your home’s backyard to the fullest. If you have a pool, though, you might have come to the conclusion that it isn’t actually serving your household as well as it could be. This is often the case for homeowners whose pool areas consist of nothing more than the pool itself and a couple of lawn chairs. As you read the rest of this article, you will find out how to create a real living space by your pool. Add a shaded gathering place. Although the Carolinas generally have beautiful weather for a significant portion of the year, the summers can get be extremely hot and sunny. This can make the idea of sitting outside with no shade in sight somewhat unbearable. 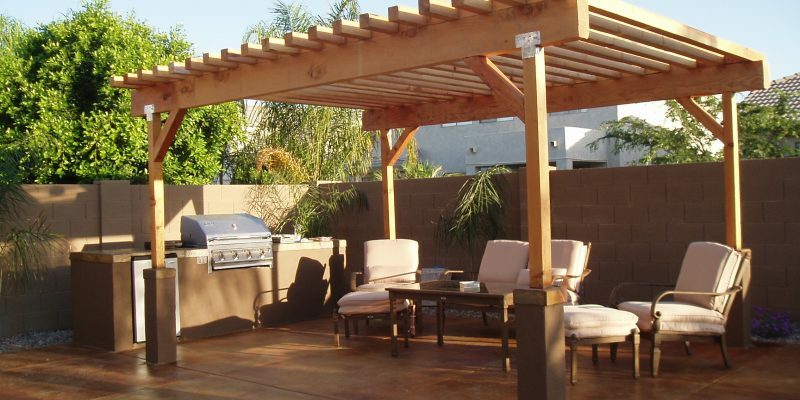 If you’re looking to make your home’s pool area more useable, one of the first things you should do is add a shaded gathering place, such as a pergola with a comfortable table and chairs underneath of it. This way, you and your loved ones will have a place to go when the heat gets to be too much! Another reason many families don’t use their pool areas as much as they thought they would is that they quickly become cluttered and stressful. Between necessary maintenance tools, pool toys, extra towels, and other items, it can feel impossible to keep everything organized in a pool space! Adding a small storage shed is the perfect solution to this problem. If you have the budget and space, you may even want to include a small changing area and bathroom in your new structure. One thing that can quickly become frustrating about hanging out by your pool is not being able to get snacks or beverages when you want them easily. Adding a functional outdoor kitchen in your pool space is the perfect way to solve this issue. Furthermore, if your family enjoys grilling on summer evenings, you’re much more likely to utilize the pool regularly if your grill is located near it. Creating a great kitchen outside can be a challenge, so it might behoove you to work with a local designer who specializes in outdoor spaces. Something else that can greatly affect how often your family actually uses your pool is a lack of lighting. This usually has the most impact toward the end of the summer and into the autumn when the days are becoming shorter. Making sure there is plenty of lighting around your pool area is key to making sure it gets used as much as possible. You should have both task lighting, such as in the kitchen, and flood lighting that illuminates the entire space. Implementing these suggestions should help you create a family-friendly pool space that all of your loved ones can enjoy for many years to come. The pool can make some of the best memories, so make sure yours is ready for entertaining this season and in the seasons to come!